The title comes from a lyric to the Chelsea 1997 FA Cup Final song where it’s instead "strolling down Fulham Road". Loyal readers of our blogs will know that I was (well still am) a Chelsea season ticket holder but I would much rather stroll down Gander Green Lane than Fulham Road these days – I have never seen such a huge disconnect between old school Chelsea fans and the club. 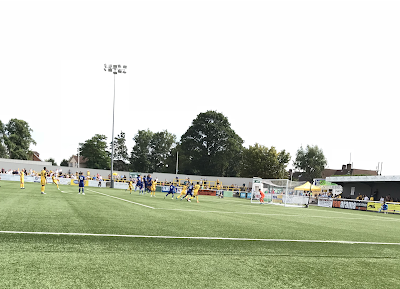 So it's no surprise that this blog happens to be for the pre-season friendly of ours against a Chelsea under 23 side. And finally it will also be a 3 o’clock kick off! No more of these lunchtime starts. Turning to the events of the week just gone and reading about the friendly against Dorking Wanderers, it seems like it was a good run out for the lads and a few goals into the bargain; bad points Tombo getting a red card and an awful 3G surface, apparently not as good as ours. Who knows, maybe it'll settle in time? Game day approaches and it’s a rather lazy Saturday morning (for a change) catching up on some Love Island and then close to 2pm, it's time to continue the lazy day and order an Uber. The first driver cancels on me even though he was only four minutes away (I guess he had a better offer!) and then it’s an extra five minutes to wait for the next one. Arriving to the ground and the bar I spot our own editor Taz with the Burgers and am told promptly “up your game” due to a big rise in readership so far this summer! Ok thanks I will write how I want but here is my thanks again to our readers. Swiftly (sort of) behind me is Dr Bell on crutches after his hip operation a couple of weeks back – good to see you back squire. Although the rest of the group are less comforting. Some work needed on their bedside manner I think. I spot The Beckwiths who instantly try to make a bet with me that “Hazard” is playing for Chelsea today, which I firmly declare as there being no way! The bet, as you ask, was a million pounds and after checking the Sutton United Instagram story it appears to be a brother of Eden who's in the line up. Shame I didn't take the bet now! Chip then mentions to Mark B how he has tickets to see Sir Elton John – that’s Our Elton to me – and I say, unbiasedly, that it will be a good show to watch and that he has great songs. Hey, I would know, I have great taste in music (I now await a message from The Ed). Fittingly, the skipper for the game is Dundo who last week after coming off the bench against Woking made his 500th appearance for the club. 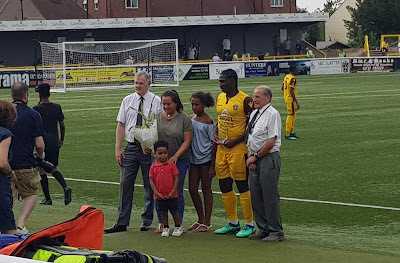 The big man is given a guard of honour onto the pitch and a presentation is made (the picture of which was pinched from Taz as I was too far away to get a decent one!). As for the Chelsea line up, most of the top youngsters are currently in Australia with the first team but names such as George McEachran, Charlie Brown, Juan Castillo and Richard Nartey with the Scottish under 21 captain Billy Gilmour on the bench are familiar to me. As we make our way to our regular spot in the Collingwood we notice some Chelsea young fans holding our position and boy these were embarrassing supporters – and this is one of the main reasons why I would rather watch non-league football than Premier League football now. So we all take our positions alongside the fence behind the goal. I am approached by an ex Civil Service colleague of mine who has come and I try to sell him non-league football, subsequently though this person was removed for bringing in “drink”. Ooops! Chelsea are awarded a penalty at the other end and it's saved by Jamie Butler, it has to be said what a poor penalty it was, but it doesn't stop me letting off a 'yessssssss'. By this point, I literally have enough of the Chelsea fans stood behind me and along with Half Time Steve’s son Ryan we make our way round to The Shoebox for a different view. Upon approaching The Shoebox I am informed that despite there being people watching along the fence (a bad thing these days), only one person has been told to move away from the fence – our very own Dr Bell, complete with his crutches. He's not happy and grumbles about an anti-ginger agenda at work. Talk turns to the first home games – my “friends” Eastleigh and the newest additions to the list of Robbo’s non-league teams I do not like – Salford City. Gary Neville may have been an eejit of a player and manager, good as a pundit/commentator, but he's back to the former talking up his Salford City side on Twitter. With not much happening on the pitch. I'll take the opportunity to wish a get well soon to Clive Greatley who told me about his ankle and to you sir I hope all gets better for Harrogate away in two weeks time. There will no doubt be a lot of standing going on. After the break, heading out for the second half I say hello to Leanne with Albie but Jensen is missing because he wanted to stay at home playing Fortnite! Kids eh? Various changes are made in the second half which sees Tommy Wright, Ross Lafayette, The JC and new boy Jonah Ayunga appear. But it is Chelsea that run out winners by two goals to nil – both scored by Peanuts’ cartoon favourite Charlie Brown, the second being with practically the last kick. I have to say though it was a good work out for the lads and I was highly impressed by Ross and Tommy up front in the second half, winning a number of balls in the air. Harry Beautyman (whose kit I will be sponsoring this season after beating of fierce competition in the club shop!) almost created a sublime free kick as per Dorking, nearly leading to a Sutton goal. A decent attendance of 750 sees a good work out for all. Usually heading to the bar it would be juke box time and I ammmmmmmmmmmm the One and Only, however it is switched off. This must be those dark forces at work that Totts is usually on about (Nope, you just don't know where the 'on' switch is! - Ed). Malcolm P instead opts to play the classic tune via his phone! Instead on the telly, we have the delights of speedway. However, a new game has soon been developed, the challengers being Southampton Steve, Dukey, Natalie and I, of who can walk in the best straight line possible. The judge was Natalie, who declared herself the winner. My demands for a review go unheard. Heading back to the bar after this enthralling competition, Dukey and I hear tales of Southampton Steve’s excursions of Russia during the recent World Cup and sounds like he had a wonderful time, just a shame England couldn't quite go all the way and end with winning the World Cup. We also speak of FIFA’s ridiculous decision to expand the World Cup to 48 teams and the dross it will bring into the competition. Euro 2020 is the next discussion and how good it will be go to places such as Bucharest and Baku, and then how the decision to include 24 teams is also a ridiculous one. Remember Euro 1992 when it was only eight teams – for info Dukey and Steve Scotland qualified top of their group ahead of Switzerland, Romania, Bulgaria and the great team of San Marino…..And it was on that note that I decided to call it a day and head home via another wonderful Uber trip. This one actually turned up and was even interested in hearing about Sutton United! As the custom goes, I would like to formally hand over to Dukey for the Winchester game on Wednesday. Not sure when he'll get to do it though as I believe he's off to Prague on the Thursday!